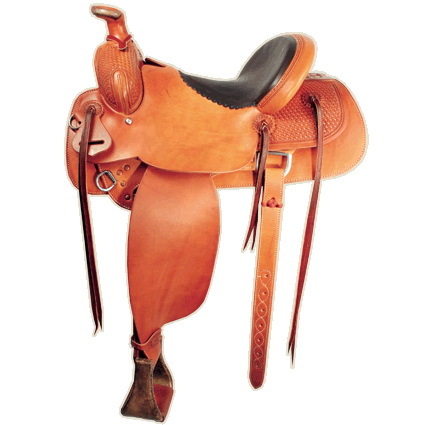 Built on a regular Modified Association tree, the Uinta Rancher has been a consistently good seller for everyone looking for a nice narrow seat and good fit for their horse. Whether it’s cowboying all day, roping, hunting or pleasure riding, this is the one for you. 8″ high by 6″ wide standard SQH (regular (narrower) QH or FQH available). #4 Dally post 3½” finished cap. 4″ by 13″ (higher and wider available). 14″ to 18″ in half inch increments. 7/8 Hamley flat plate at a minimal additional cost and is preferred (other styles available). 3″ leather covered ropers standard (other sizes and covers are optional). 3″ full leathers (others optional). Square with rounded comers standard (other options available).